If your business or organization has recently moved, try printing in-house on our door hangers. This is a cost-effective method of spreading the word about your new location. Using our wild canary printable hangers allows you to target a specific area or neighborhood. 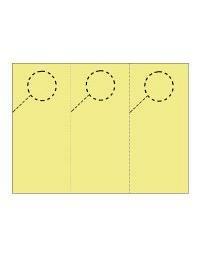 Each sheet has three door hangers separated by a micro-perforation for a clean tear-away.